DRS Tactical Systems, a subsidiary of DRS Technologies (Finmeccanica Group) has unveiled its newest ARMOR™ rugged tablet computer, the ARMOR™ X10gx. This all-new 10.4″ rugged tablet enhances the efficiency and productivity of an increasingly mobile workforce and is planned to ship by September 15, 2010. “The ARMOR™ X10gx is our tenth generation offering. We have drawn upon many years of our experience as well as the experience from our military and commercial personnel that have deployed our rugged mobile computers around the world,” said Mike Sarrica, vice president and general manager for DRS Tactical Systems. “To meet the demanding conditions encountered by people working in field service; transportation, rail and port facilities; public safety, and other areas of challenging environments, our new rugged tablet meets MIL-STD-810G and is approved by UL for use in explosive and/or hazardous environments. It also carries an ingress protection (IP) rating of 67, meaning it is fully protected against dust and can withstand the effects of immersion in water to depths up to 1 meter,” Sarrica added. With a weight of just 4.7 lbs. and certified to operate in extreme conditions, the ARMOR™ X10gx also features a new docking system, AT&T wireless certification and an optional integrated Gobi™ 2000 mobile broadband to keep the user connected on multiple wireless networks. The ARMOR™ brand is based on over 25 years of experience developing computer and display systems that survive in the harshest environments. DRS Tactical Systems has both a strong legacy in military computing and, due to its 2005 acquisition of Walkabout Computers, a rich heritage in industrial tablet computing. The combination of legacy and heritage has resulted in a unique competitive advantage that is now available to its partners. The all-new ARMOR X10 Rugged Tablet with Intel® Core Duo™ Mobile technology is one of the most durable, reliable and easy-to-use tablet computers on the market today. Housed in our specially designed aluminum DuraCase™ chassis with ShutOut™ sealing technology, the ARMOR X10 Tablet meets IP 66 level protection from dust, dirt, water and other damaging elements while still offering no-flap input connections and hot-swappable battery access without the need for tools. Inside the ARMOR X10, a user-replaceable 2.5″ hard drive and our exclusive QuickBack™ Data Recovery System provide advanced protection for your valuable data. 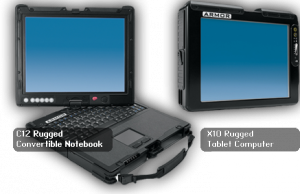 With integrated Wi-Fi, Bluetooth, Ethernet, Type III PCMCIA slot and an internal OEM FlexSpace™ for GPS or custom solutions, the ARMOR X10 offers flexible communication options for any application. Available in both touch and passive pen versions, the LCD monitor uses backlight technology (CCFL and LED) for amazing indoor and outdoor viewability. Designed, manufactured and qualified to meet military specifications (MIL-STD-810F), all units are tested for drop-shock, moisture, dust and vibration resistance, temperature extremes as well as other demanding conditions mobile workers face daily in the field, on the road or in the office. The ARMOR X10 is an incredible solution for commercial and government customers needing the ultimate in data protection and seeking efficiency improvements in the harshest working conditions.